A historic season for the men’s soccer team came to a close as it lost to No. 4 Louisville in the Sweet 16 of the NCAA Tournament at the end of November. 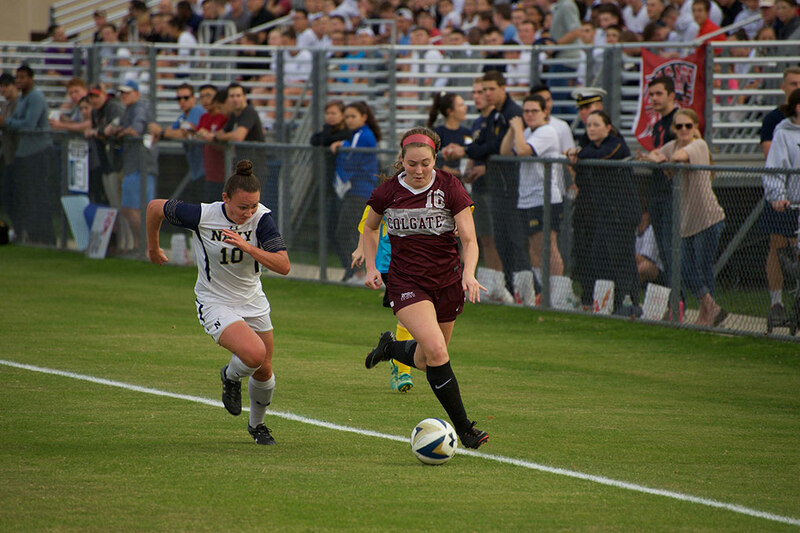 The Cardinals secured a 2–0 victory and put Louisville in the Elite Eight. Even so, the Raiders had an unforgettable season, having captured their second-straight and seventh overall Patriot League Championship. 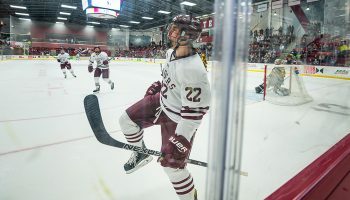 Colgate went on to win its first NCAA Tournament game in program history, beating the University of Massachusetts (2–0) in the first round. The Raiders then punched their ticket to their first-ever Sweet 16, with a 3–2 win over Michigan’s Wolverines in the second round of the tournament. Colgate was the first Patriot League team to reach the Sweet 16 since 2006. 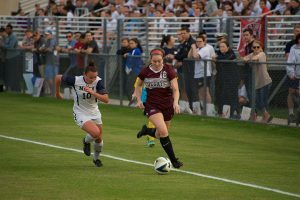 The university’s student-athletes posted a 98 percent Student Graduation Success Rate (GSR) for the sixth consecutive year, according to NCAA figures released in November. Colgate’s 98 percent rate stands as the second-highest nationally among Division I institutions and was even with the likes of Princeton and Notre Dame. 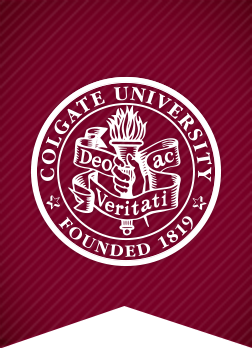 Colgate ranked above the University of Pennsylvania, Stanford, Northwestern, and Duke at 97 percent, and Cornell and Vanderbilt at 96 percent. 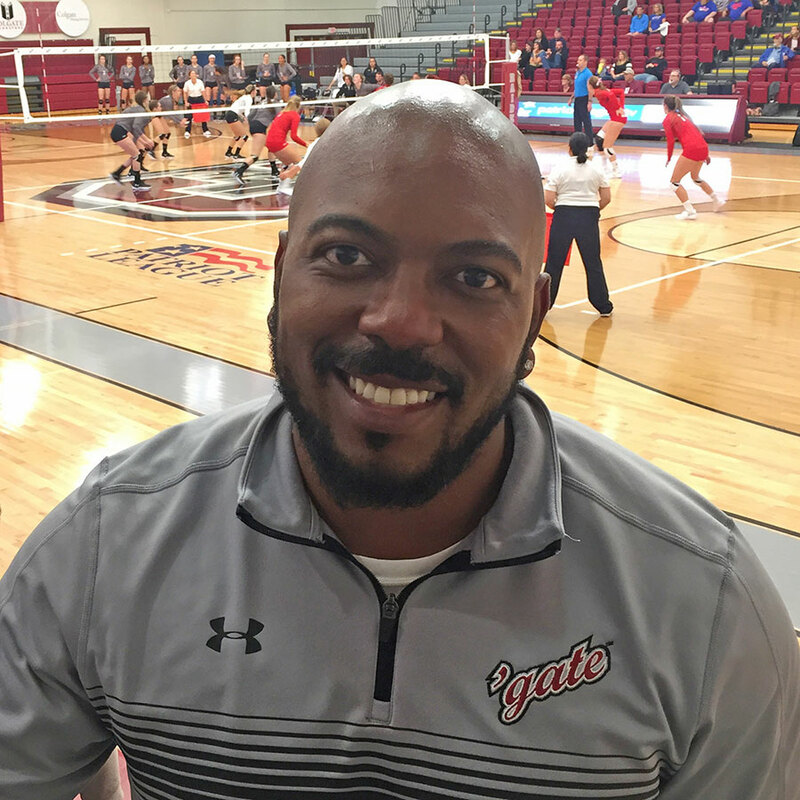 Colgate recorded perfect 100 percent GSR scores from 23 of its 24 NCAA-sponsored teams. 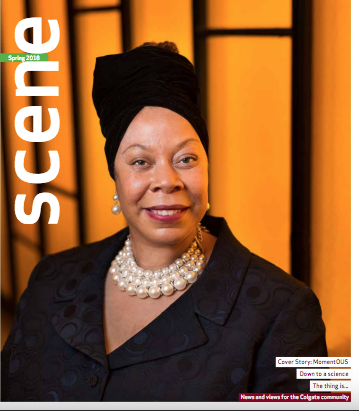 The Division I Board of Directors created the GSR in response to Division I college and university presidents who wanted data that more accurately reflected the mobility of college students than the federal graduation rate. The GSR formula removes from the rate student-athletes who leave school while academically eligible and includes student-athletes who transfer to a school after initially enrolling elsewhere. This calculation makes it a more complete and accurate look at student-athlete success. 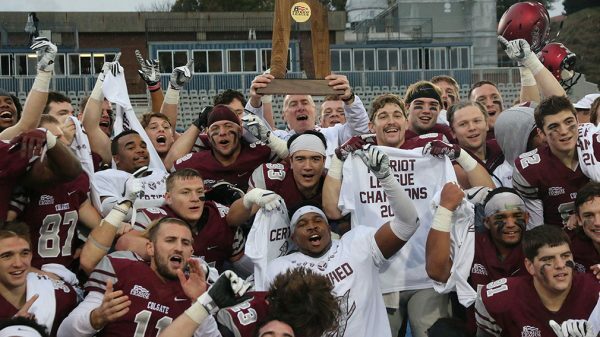 With a 35–10 thumping of Georgetown in November, Colgate’s football team captured its ninth Patriot League title. The win was Colgate’s fifth in a row to end the season, helping the Raiders wrap up a 5–1 Patriot League campaign. 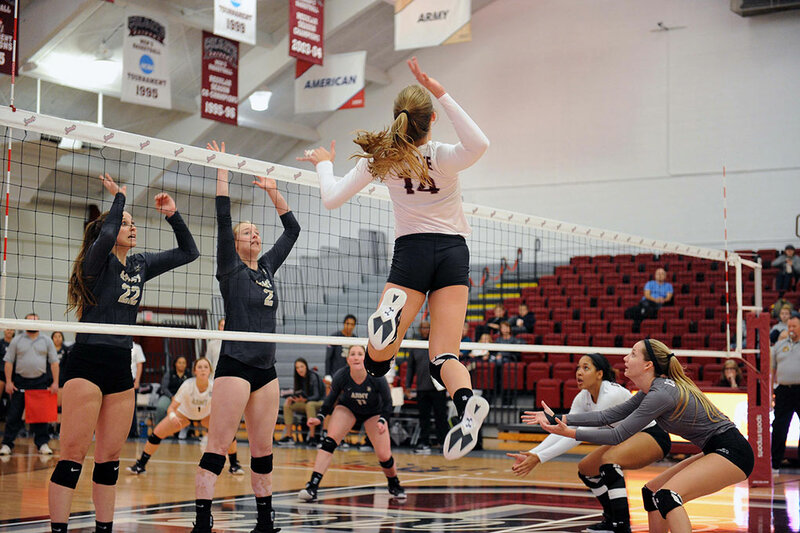 Colgate finished 7–4 overall and is the only 2017 Patriot League team to sport an overall winning record. After the win on Georgetown’s Cooper Field, the Raiders celebrated — many of them doing so for the second time in three seasons — and were joined on the turf postgame by many of the alumni from the 2015 NCAA playoff run. “They fought hard, and after a blip early, played our style of football and finished it the right way,” Head Coach Dan Hunt said. Although the team did not receive an at-large bid to the NCAA Football Championship Subdivision playoffs, it landed two major Patriot League Awards. Hunt was named Coach of the Year for the second time in three seasons, and Grant Breneman ’21 earned Patriot League Rookie of the Year. Also, Colgate placed 13 players on the All-Patriot League first and second teams. Grab a few minutes alone with Brion Applegate ’76 on campus, and the subject can quickly turn to football. Applegate played for the Raiders in the 1974 and 1975 seasons after transferring from the U.S. Air Force Academy. During that change, he made the move from quarterback to wide receiver and wound up averaging 20.4 yards per catch his senior season. No Colgate Raider has matched that mark in 42 years. Since his playing days, few have equaled what Applegate has accomplished off the field as well for Raider Athletics. The Beachwood, N.J., native, who co-founded Spectrum Equity in 1994 and has been involved in private equity investing since 1979, was inducted into the 2017 Colgate Athletics Hall of Honor. Applegate still loves to talk football, all while downplaying his own accomplishments. 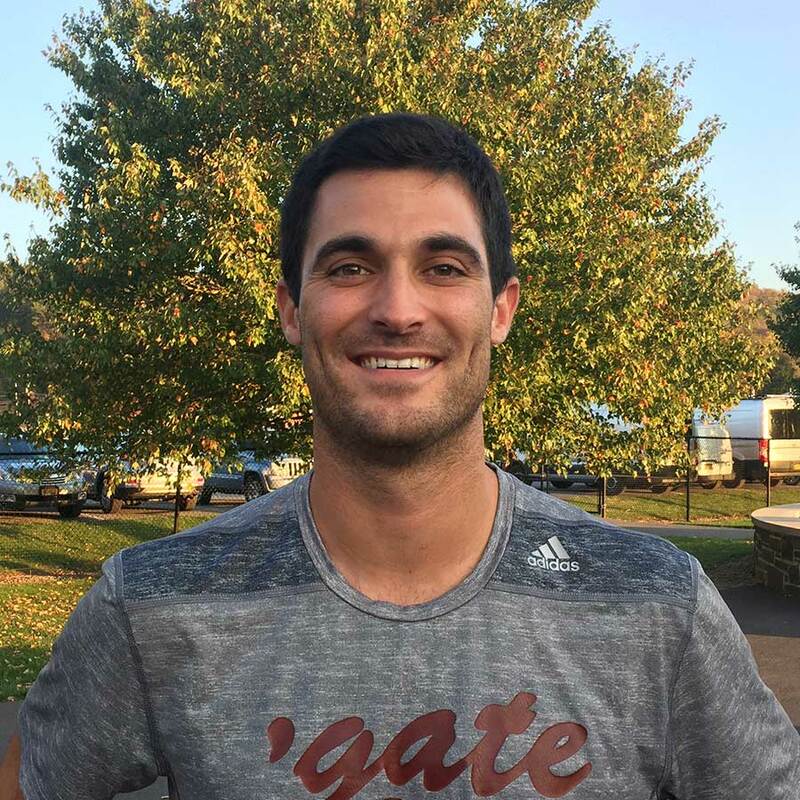 “The consequence of that receiving record in terms of yardage per catch was really a lot more related to the number of attempts and number of completions,” said Applegate, who that year caught 25 balls for 510 yards and two touchdowns. “Back then — the offense we were playing was a wishbone option — we were maybe throwing 10 or 15 passes per game. Applegate might have a point. He’s the last Raider to lead the team in receiving with as few as 25 receptions. John Maddaluna III ’17 topped the last two seasons with 62 and 54, respectively. 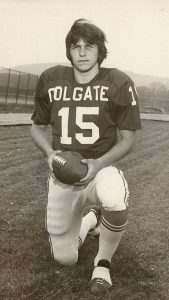 But Applegate’s 20.4 yards speaks for itself, and that number helped propel Colgate to a 6-4 mark in the 1975 campaign. Colgate got the ball back and drove the length of the field to tie the game with a touchdown, 21–21, with almost no time left on the clock. The extra point was good and Colgate escaped with the victory. “When we came back and won that game, our sidelines went wild and our fans at old Palmer Stadium went crazy,” he said. Applegate enrolled at the Air Force Academy out of high school and played quarterback there for the freshman team. But he decided to transfer to Colgate, having remembered his exceptional visit a few years back. His host for that visit: Mark van Eeghen ’74, who went on to play for the NFL. Applegate was drawn to the campus by its people, had that magical season 42 years ago, and remains a huge influence on Colgate’s present and future. He is a Board of Trustee member emeritus and served on the Athletic Affairs Committee. 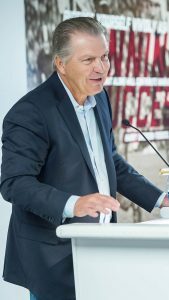 He is a member of Raiders for Excellence and has donated to several athletics capital campaigns, including the Class of 1965 Arena, football press box, indoor golf facility, and most recently the new football locker room, team meeting room — which he named for his mother, Ruth Cline Applegate — and academic enhancement center. Lift your head up in a huddle to look into your teammates’ eyes before a big game, take an extra minute in the locker room after everyone has cleared out, walk out onto the game field by yourself on a recovery day just to breathe the air of the place you love most on campus. The next four years will come and go faster than you’ll ever imagine, and that is what I would do to slow it down for myself, knowing that I may only have four years left playing the sport that helped me grow into the person I am today. I thought that slowing it down was the only way to appreciate the game. But as I have made my way through my time here, I’ve realized that it isn’t just those moments where I slow it down that make me appreciate the game the most. 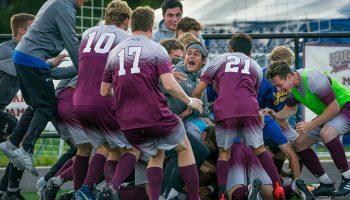 It is those moments in combination with the fast, intense, loud, and emotional moments that really make me love everything about Colgate soccer. It’s the 2v2 mini-goal games that get so competitive that you won’t talk to your teammate for an hour after practice, or the on-top-of-the-world feeling of winning a game in overtime and dog-piling each other, or screaming the fight song with your team on the bus traveling back from an away game. Don’t look past those moments, even though they may be easy to take for granted and even though they pass faster than others. So look into your teammates’ eyes in the huddle before a big game one day, but be the one screaming at the top of your lungs bringing the energy to the huddle the next day. Take a quiet minute alone in the locker room one day, but be the one leading the locker room dance-off the next day. Walk onto the field on a recovery day just to breathe the air one day, but get out there alone and push yourself through extra full-field sprints the next day. Don’t keep it too slow, but don’t make it all go by too fast. Find the balance to appreciate the incredible next four years of playing the best sport in the world alongside your best friends. Going for the Gold. Colgate’s Class of 1965 Arena, opened in fall 2016, earned LEED Gold certification from the U.S. Green Building Council in November. The arena houses an ice hockey rink in addition to facilities for Colgate’s lacrosse and soccer teams. The certification is earned through sustainable building methods and systems. This commitment toward green building practices started in 2011 with the construction of the Trudy Fitness Center. Colgate has a minimum goal of LEED Silver certification for all new construction and major renovations. When Scott Whyatt ’86 wore maroon, the Colgate football team was often the underdog. Now, he’s helping other kinds of underdogs. Whyatt is the co-founder and executive director of TracysDogs, a nonprofit dog rescue and adoption organization headquartered in San Antonio, Texas, that has rescued nearly 4,000 canines to date. TracysDogs was founded in 2011 when Whyatt’s wife, Tracy, was furloughed from her job. An avid animal lover, she began going down to city animal shelters in San Antonio and recording videos on social media of the animals in need of homes. “We started getting calls from people all over the country wanting to adopt the dogs that were being housed in a facility where they really had no exposure to anybody,” Whyatt says. “They put those dogs into an overflow complex because there was no room available at the main, public facility and they believed them to be unadoptable, so they were really just housing them prior to euthanasia.” At that time, the city of San Antonio euthanized approximately 75–80 percent of the dogs it took in because of lack of city resources, he explained. The idea of creating a rescue organization came about when the Whyatts received a call from a woman who had recently moved from San Antonio to Denver. She said that if they brought a few dogs to the Mile High City, she might be able to get them adopted at a PetSmart event on the weekend. At that point, the couple decided to create their own adoption organization that would focus on rescuing dogs from high-kill shelters and give them a place to stay until they could find permanent homes. Scott, Tracy, and their team, which is primarily volunteer based, have built their brand around rescuing dogs with pending euthanasia dates located in South Texas municipal shelters, then rehabilitating and re-homing them with individuals and families who demonstrate a commitment to providing a loving, caring, and nurturing home environment. The organization adopts to families all over the country, running transport events called “Gotcha Days” once a month. Potential adopters apply online and speak with an adoptions manager and counselor to choose a dog that is the right fit. Once approved, adopters meet and take home their new family member at a Gotcha Day around the country. 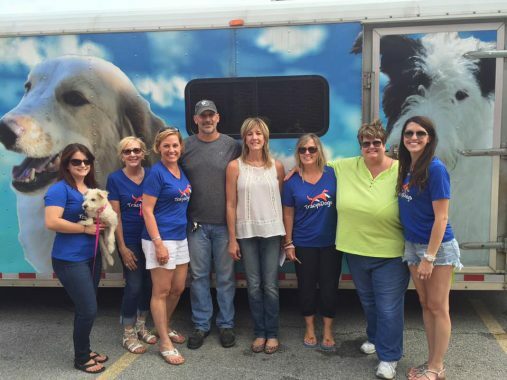 TracysDogs has continued to grow and has proven to be one of the most successful rescues in Texas. But, running a rescue isn’t easy. It takes a lot of dedication, another value Whyatt honed during his time as a Raider. What brings you to the game today? School spirit. 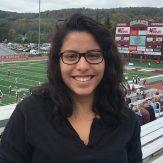 I love supporting Colgate teams. 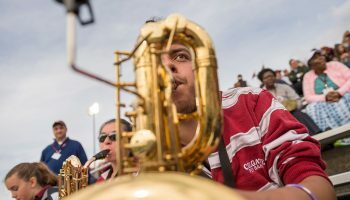 What’s your favorite Colgate sports tradition? The wave. It hypes everybody up. What do you think makes a good Colgate fan? Someone who sticks around from the beginning to the end. They don’t leave because they’re not going to give up. Do you have any pregame rituals? Before I come to a Colgate sporting event, I get pumped up with really good jams. What’s the craziest thing you’ve seen at a Colgate sporting event? My senior year, the volleyball team won the Patriot League championship. We all stormed the court and just went nuts. One of my good friends played on the team, and we picked her up and started throwing her around. It was pretty wild. 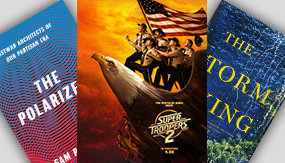 What are you doing now that you’ve graduated? 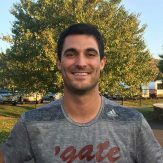 I’m a math teacher and varsity soccer coach at North Hunterdon High School (Annandale, N.J.). What’s your favorite part about watching volleyball? The passion with which the young women play. I am a former student-athlete, and I recognize that having passion is vital in order to be successful in competing against opponents. It’s absolutely wonderful to have these young women compete and fight at that level. Do you have any pregame rituals? I’m always there trying to hype up the student-athletes. I joke with them, saying, “Hey, I need you to be big today.” And they understand that they are going to play big. What would people be surprised to know about you? I actually sang the national anthem my first year here. I held my own.